Free Learning games for kids offer an incredible opportunity to strengthen concepts taught in school. Some learning games even come with video tutorials, which can help children understand concepts that slipped past them while in class. There are a three simple steps in choosing and using a learning game that will help your child excel. Choose a Free learning game for kids that is aligned to the current educational standards. There are a ton of games out there, however not all of them are aligned to the common core standards. Like them or not, in order for your child to be successful in school, they need to be able to excel within the common core educational standards. Like all previous educational standards, common core standards have specific requirements for each grade level. These requirements spiral up in difficulty. In other words, children start with basic concepts in first grade like adding and subtracting numbers up to 100. In second grade the same concept is build upon, and spirals up in difficulty by having children add and subtract numbers up to 1,000. The biggest difference with common core is that children must “Explain their Reasoning”, or explain how they came up with their answer. This is the most difficult part of common core standards, but there is some good news here. The more children “Explain their Reasoning” the faster they learn. 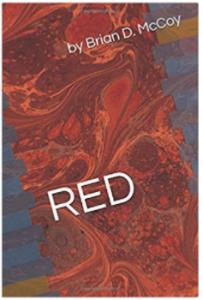 By explaining how they came up with the solution to any problem, whether in math, English language arts, social studies, or science children develop a deeper understanding. Practice also make children more skillful at explaining their answers. It is like anything in life; in order to be a great gymnast, you must practice flipping, spinning, rolling and twisting every day. In order to be a great baseball player, you must throw, catch, bat, and sprint for first base every day. In order to be great at “Explaining your Reasoning” you must practice showing people how you came up with your answer. There are plenty of games that are aligned to the common core standards, however very few allow children to “Explain their Reasoning”. As a matter of fact, the only game I know of that allows children to “Explain their Reasoning” is TeachersDungeon. Share in the excitement of the free learning game for kids. When your child plays any learning game they will earn coins, badges, crystals, or whatever the game uses to reward their players. By sharing in your child’s accomplishments, you will help develop a sense of pride, as well as developing their self-esteem. This also keeps your child interested in playing the learning game, which to be honest will never be as much fun as playing a game like MineCraft, Zoo Tycoon, or Angry Birds. I encourage parents to look at the stats page once a week. Check the percent correct and use it as an opportunity for praise. It is fundamental human nature to become motivated when people compliment us. Praise from a parent is all the more powerful. The more your child plays a learning game that is set to the current educational standards, the more they will learn, and the better they will do in school. Here is an example of a stats page. The names and scores have been changed to protect the innocent, but the praising is similar to what I might say to one of my students. 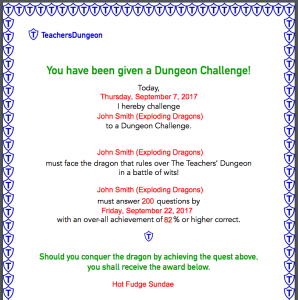 TeachersDungeon is a free learning game for kids that offers an easy to use “Dungeon Challenge”. As the parent, you enter the number of questions that you want your child to answer within a week. Set the percent correct based upon last week’s percentage. For example, the photo above shows that the child got an overall score of 83% correct. I would suggest either keeping it at 83% or pumping it up 1% to 84% correct. You want to make sure the challenge is achievable. If you increase the challenge by 1% a month, this child would jump from a “B” to an “A” by the end of the school year. Take the time to sit with your child and have them “Explain their Reasoning” to you. 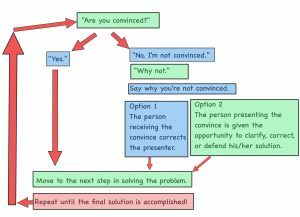 I have a simple method that I teach in my class called a “Convince Me”. The coolest part of the “Convince Me” is that when someone is wrong, you say, “I’m not convinced”. This gives the child an opportunity to explain further. Sometimes the child giving the “Convince Me” is wrong and sometime the person that is not convinced is wrong. Either way, this opens a dialogue where learning is enhanced and a deeper understanding is gained. The advantage is that both people are working together to solve the problem. Here is an example of how a Convince Me works. This is a student giving his “Convince Me” to me. As you can see, “Convince Me’s” turn a mistake into an opportunity for learning, rather than something to feel any shame about. TeachersDungeon is the only free learning game for kids that allows your child to submit video tutorials. If you make a video like the one above with your child, you can submit it to TeachersDungeon. Once approved, your child’s video could become one of the tutorials within the game. Because of this, TeachersDungeon is the only game I know of that reaches the 90% level of learning! Here is another Convince Me. This time I am giving the student a “Convince Me”. Like anything, doing a “Convince Me” takes a bit of practice, but once a child becomes familiar with the process the learning is invaluable. “Convince Me’s” not only strengthen your child’s understanding of educational concepts, they also help you understand exactly where your child’s misconceptions lay. Learning Games must be relevant to today’s educational standards. Learning Games must adjust to each child’s individual ability level. Learning Games need to have a healthy balance of educational value and gaming rewards. Learning Games need to show children how to achieve the correct answer. Learning Games must drive children toward the highest level of learning. Learning Games must keep track of children’s educational progress. For an in-depth look at what makes a learning game worth while, read my post entitled, Free Children’s Learning Games – Are they a waste of time? My first year of teaching, I started playing with the idea of developing a game that reviewed the entire year’s curriculum. I wanted to spend the last two weeks of school playing the game and review everything that I had taught over the course of that year. My first year I taught 2nd grade. Through the years I moved from grade to grade. After over 25-years of teaching, I have taught every grade from 2nd through 6th. With each new grade level, I developed a whole new set of questions for my game. Every year kids came back to visit me. They always asked if I was still playing The Teachers’ Dungeon. They said that they loved playing the game, and that I should make it into a game that all kids could play. I decided to hire a programmer and develop an on-line version to my game. The on-line version is called TeachersDungeon. I did not have a multi million-dollar budget like Disney, so I had to be very clear in what I wanted my game to accomplish. I wanted a game that fulfilled the 6-factors that make an effective learning game. I believe that I have done exactly that. TeachersDungeon is a free learning game for kids. I made it free, because I wanted to help as many children as possible. Game-Play that adjusts to each child’s individual ability level. A healthy balance of educational value and gaming rewards. 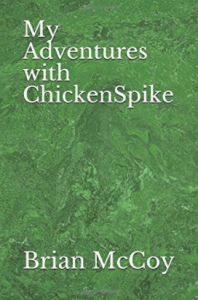 Children get to battle a dragon and earn magical crystals that they use to save creatures from the dungeon, build their castle, and work their way to king or queen. Video tutorials that show children how to achieve the correct answer. The ability for children to create and submit their own video tutorials, which drives children toward the highest level of learning – “Explaining their Reasoning”. 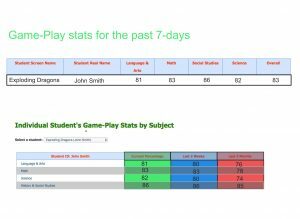 From your parent or teacher account you can access your children’s stats page and see their educational progress. My “Life’s Mission” is to help as many children as possible reach their full potential. I truly believe that every child can have a fruitful educational career. That is why I have made TeachersDungeon completely free. Video Tutorials are included – even in the free version. Is TeachersDungeon the right Learning Game for Your Child? Do you believe that learning games are worth your child’s time? 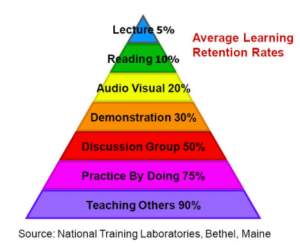 Do you believe that TeachersDungeon has the 6-factors of an effective learning game? Will your child enjoy playing TeachersDungeon? If you have any questions or would like to share your feelings about this learning game, please leave a comment below. I will reply as quickly as possible. Previous Free Learning Games For Kids – Do they really motivate children to learn? Next 3rd Grade Reading Help – Four simple steps to ensure your child will excel in reading?